Oh yeah he’s back AND he’s ready! It’s A Whole New Time-Traveling Adventure! All new-style gameplay action – scuba dive, ride a motorcycle, a baby T-Rex, and go free-roaming airborne in a plane! Play as Coco! Gallop along the Great Wall of China on a tiger, go extreme on a jet-ski and other high-flying surprises! All new enemies include a new Big Boss, Uka Uka, N.Tropy, a menacing Dingodile, and of course, the return of some favorites like N.Gin and Tiny. Collectors’ Edition Release (Part of 3 Pack) – Same As the Other CE, but included in a variant release of the Collectors’ Edition. Some of the artwork where Crash is on the motorcycle with the bazooka is an homage to Terminator 2. On the back of the case, the new character Uka Uka is referred to as ‘Big Boss’. This moniker is usually associated to a Metal Gear character. 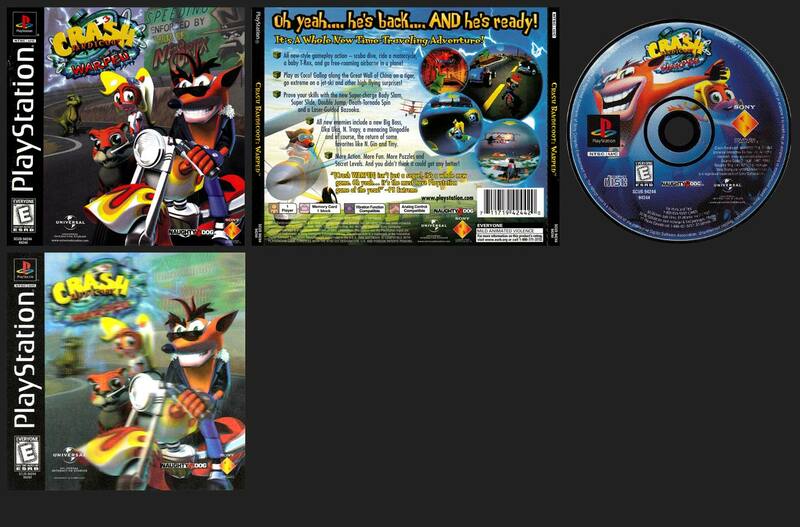 Despite not having it formally in the title, the actual 3 in “Crash Bandicoot 3: Warped” is hinted at in the stopwatch behind the logo. There is a hidden demo of Spyro the Dragon on the disc. To access it requires an homage to the infamous ‘Konami Code’. At the title screen, press Up, Up, Down, Down, Left, Right, Left, Right, Square.